SAP account groups are used to maintain intervals, segregate G/L accounts groups, and define field statuses. SAP account group has a four-digit alphanumeric code and serves for organization of G/L account master data based on specifications on how G/L account master data to be defined. SAP account group controls G/L account intervals and screen layouts while defining or extending G/L account master data at the company code level. SAP account group helps users to define required fields while creating the G/L account master data. For example, the fields for entering a reconciliation account and open item management indicator are not required for Profit and Loss accounts. As per the requirement of the company, SAP account groups can be created and are defined at the chart of accounts level as explained below. How to Create SAP Account Group? Financial Accounting (New) – General Ledger Accounting (New) – Master Data – G/L Accounts- Preparations – Define Account Group. Or directly start the transaction OBD4 (define SAP account group) using the transaction bar. Relevant table: T077S (G/L account groups). Chart of accounts: G/L accounts are defined at the chart of accounts level. Account group: A four-digit identification to group certain G/L accounts. Name: Name to the account group. From account: Starting number in the range of accounts belonging to a particular account group. To account: Ending number in the range of accounts belonging to a particular account group. After creation of account group, please click on button to customize how SAP will display screens for creating and editing G/L accounts belonging to a particular account group. We can control appearance and requirements for entry of the fields available the screens of transactions for editing G/L accounts’ master data. This is done by defining field statuses as suppress/required/optional/display. All the fields are divided into different groups as shown on the picture enclosed below. By double clicking on each group we can define whether the fields will be suppress, required, optional or display. Suppress: Field is not visible while creating the G/L master record. Required: Field is mandatory while creating the G/L master record. Optional: Field is available for entry but not mandatory to update. Display: Field available only in display mode. Let’s discuss each group of fields one by one. 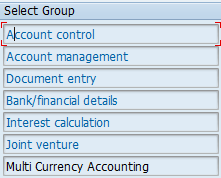 Available fields in account control group. This group contains fields of company code level G/L account creation. Currency: G/L account currency, by default it is company code currency, it can be change also. Tax category: To maintain tax category for the G/L account, so that tax-related postings are possible while booking transactions. Reconciliation account: G/L account which be maintained in the master data of Vendor, Customer and Asset accounts. Exchange rate difference: Key for account determination to perform foreign currency valuation. Account managed in ext. system: If the same account is used in another application, then this field status will be defined. Only balance in local currency: To update only in local currency. Alternative account number: To update country chart of accounts G/L master record. Inflation key: Only useful when inflation accounting is used in financial accounting. Tolerance group: Useful to maintain if any difference raised while clearing of open items. Available fields in account management. This group contains fields of company code level G/L account creation. Line item management: To activate line item display. Open item management: To activate line items as open items to perform clearing. Sort key: Sorting the data while execution of reports. Authorization group: To control through authorization object. Administrator: It is called accounting clerk. Available fields in document entry. This group contains fields of company code level G/L account creation. Reconciliation account ready for input: To enable the alternative reconciliation change functionality. Field status group: To maintain which fields are required while booking transactions. Post automatically only: To restrict manual postings. Supplement automatic postings: To activate bank charges while posting incoming payments. Available fields in Bank/financial details. This group contains fields of company code level G/L account creation. Planning level: To control display in cash management. Commitment item: To be used for budgeting. Relevant to cash flow: To define as a cash flow account. House bank: Default house bank. Bank account: Default bank account. Available fields in Interest calculation. This group contains fields of company code level G/L account creation. Interest calculation: To activate or specify account for interest calculation. Available fields in Joint venture. This group contains fields of company code level G/L account creation. Recovery indicator: To allow booking of incurred costs. Available fields in Multi currency accounting. This group contains fields of company code level G/L account creation. Multi currency accounting: To activate multi-currency accounting.